Northern Bedford’s Caleb Diehl, 21, looks for an open teammate while Tussey Mountain’s Jordan Berkstresser, 14, tries to get ball during the second half, Friday. Tussey Mountain's Dawson Rightenour, 23, tries to block Northern Bedford's Caleb Diehl's shot during the first half, Friday. Tussey Mountain's Jordan Berkstresser, left, tries to slow down Northern Bedford's Haden Foor during Friday's game. Tussey Mountain’s Alex Gonzalez, 10, tries to get the ball past Northern Bedford’s Caleb Diehl, 21, and Thad Leidy, 10, during the first half of Friday’s game. Northern Bedford's Thad Leidy calls out a play during the third quarter in Friday night's Inter-County Conference game against Tussey Mountain. Tussey Mountain’s Matt Leonard, 21, goes up for a lay-up during the first quarter, Friday. Tussey Mountain's Chad Morningstar looks to pass the ball during the second half, Friday. The Titans hosted Northern Bedford in ICC action, winning 77-48. SAXTON – While the game between Northern Bedford and Tussey Mountain started out close, it ended up anything but close. While the deficit was just a point at the end of the first, and nine points at the half, the hosting Titans used a strong second half to win, 77-48. Northern Bedford took the initial lead as the game begin, but the Titans used s six-point streak to take a 6-2 lead. Dalton Smith and Haden Foor sandwiched a pair of buckets around a Tussey Mountain basket, trailing 8-6. Tussey Mountain’s Jordan Berkstresser and Chad Morningstar added a basket each to push Tussey ahead, 12-6, but the visitors fought back. Thad Leidy scored on two lay-ups, while Smith added one as well to tie the game, 12-12, with 1:38 left in the opening period. After an exchange of baskets, the Titans’ Matt Leonard scored on a free throw as the opening period came to a close with the Titans leading, 15-14. Leonard added seven more points as the second quarter opened, pushing Tussey Mountain’s lead to eight points, 22-14. Tussey added another four-point rally later in the period, but the Black Panthers strung together a six-point stretch. Leonard had a pair of free throws and Morningstar added a lay-up to help the hosts to a 12-point advantage, 29-17. Northern Bedford’s Caleb Diehl hit consecutive three-pointers, cutting the lead to six points, 29-23. Morningstar got a putback, but Foor scored a pair from the line. Mason Reed answered with a basket and a free throw, but Northern’s Dakota Claar got a bucket. With the help of a five-point run, Tussey Mountain got a 12-point lead, but a three by Smith as the buzzer sounded cut the deficit to nine points, 39-30. Two minutes into the second half, the Titans led the Black Panthers, 42-36. The hosts finished out the third period with a 14-point run, continuing the rally into the fourth quarter with a lay-up by Leonard, pulling ahead, 58-36. 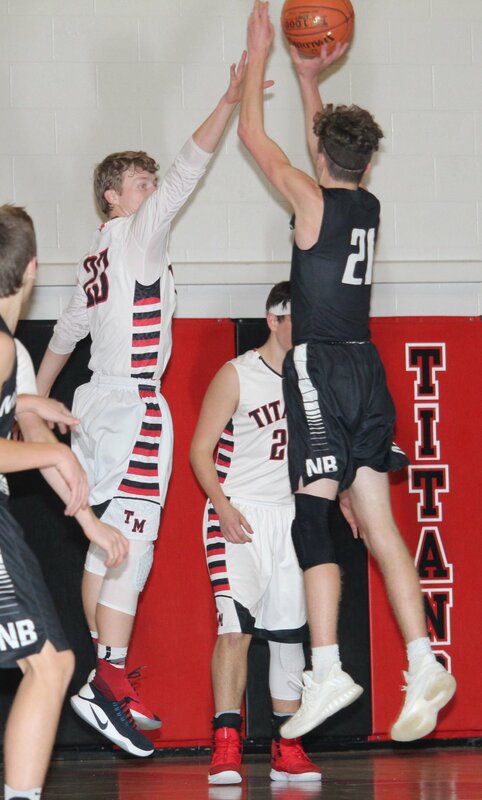 Tussey Mountain outscored Northern Bedford 21-12 in the final period to secure the 77-48 victory, snapping a three-game losing skid. “I told the boys they did a nice job,” Swope added. “This is the system I’ve been teaching them. It doesn’t matter who I put in. It doesn’t matter which five are in there — you execute the plan. You’ll have success. “Our kids played really well in the first half,” said Northern Bedford coach Shawn Hicks. “We executed offensively. The kids were pushing the ball on the fast breaks. Leonard led the night with 27 points, while Morningstar and Berkstresser each chipped in 14 points for the Titans. Northern Bedford’s Diehl led the Black Panthers with 17 points, while Smith finished with 12. Tussey Mountain visits Southern Fulton on Tuesday, while Northern Bedford hosts McConnellsburg on Monday. Northern Bedford (48) — Caleb Diehl (3) 4 0-0 17; Dakota Claar 2 0-0 4; Haden Foor 2 3-5 7; Thad Leidy 3 0-0 6; Dalton Smith (1) 4 1-3 12; Franklin Foor 0 0-0 0; Cadin Ebersole 0 0-0 0; Evan Clouse 0 0-0 0; Talan Walter 0 0-0 0; Hayden Reyan 0 0-0 0; Bentley Zimmerman 1 0-0 2. Totals: (4) 16 4-8 48. Tussey Mountain (77) — Devin Swope 1 0-0 2; Matthew Leonard (2) 8 5-6 27; Chad Morningstar 6 2-3 14; Jordan Berkstresser (2) 3 2-2 14; Dawson Rightenour 4 1-2 9; Mason Reed 3 1-3 7; Alex Gonzalez 1 0-0 2; Devin Neuder 0 0-0 0; Logan Reed 0 0-0 0; Dawson Kling 0 2-2 2; Ayden Forlina 0 0-0 0. Totals: (4) 26 13-20 77. JV — Northern Bedford, 52-36. High Scorers — NB: F. Foor, 17; TM: Gonzalez, 11. Contact Codi Weyant at cweyant@bedfordgazette.com or at 623-1151 ext. 155. Cloudy with occasional rain showers. High 61F. Winds SE at 5 to 10 mph. Chance of rain 80%.. Steady light rain this evening. Showers continuing overnight. Low near 55F. Winds SE at 5 to 10 mph. Chance of rain 70%.